Have everyone in the family cut back on one item they enjoy (like the second cup of coffee or ice cream) and put the money into a travel fund. Sell old items you don’t need on Craigslist or at a yard sale. Start couponing. The entire family can help plan budget meals based on the week’s coupons and store deals. Eat out less often and instead cook together as a family. Drop your gym memberships and instead work out at home. Instead of hiring a baby-sitter, trade baby-sitting duties with other families in your neighborhood. Start a community carpool so you spend less on gas. Cut back on TV – switch to a more basic cable package or get rid of it completely and use Netflix. Shop without the kids whenever possible – there will be fewer impulse buys like toys and candy. Cancel any credit card that charges and monthly or annual fee – there are free options out there. Book flights for mid-week. They’re the same flights, but at a cheaper price. Check out cruises and all-inclusive resorts – you get everything for one price that is often much lower than planning everything yourself. Call the hotel and ask if there are cheaper room options available. Often, all you have to do is ask. If you’re driving, do a little online research to see where gas is cheapest in the U.S. and plan your fill-ups carefully. Consider a camping trip – paying for a campsite is much cheaper than paying for a hotel room (and some even have fairly nice shower facilities). Follow travel companies (like airlines and hotels) on Twitter – they sometimes tweet out discount codes and deals. Like travel companies on Facebook – they sometimes offer discount codes and deals on their pages. If you have a blog, offer to write about your experiences at a restaurant, hotel, etc. in exchange for a discounted price. Order advanced tickets for the activities you want to do, since there’s usually a discount versus purchasing in-person at the door. Avoid traveling around holidays, when flights and gas are more expensive. Bring your own groceries for quick meals and snacks. Bonus: On top of being cheaper, it’s also healthier. Pack as efficiently as possible. Most airlines charge for every bag you check, so share suitcases if possible rather than packing a separate one for each member of the family. Order off the lunch or half-portion menu. You can’t take leftovers with you anyway! Spend some time relaxing by the hotel pool instead of paying for activities. Look for free activity options, such as hiking in national parks, lounging on free beaches, or visiting museums where tickets for kids are heavily discounted. Avoid shopping, even at outlets or “window shopping” – you don’t want to spend more than you’ve budgeted. Wake up in time for the hotel’s complimentary breakfast every morning. Otherwise, you could spend hundreds to feed your family in the morning over the duration of your vacation. Keep the mini-fridge firmly closed and forget the overpriced vending machines in the hall. When you leave, double-check that no hotel towels or other items get packed by accident. The hotel will charge an arm and a leg for missing items! Drink plenty of water. Alcoholic beverages and even kid-friendly drinks like smoothies and lemonade can be extremely expensive at restaurants and resorts. 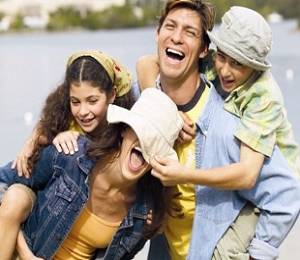 Lastly, as a bonus tip, make sure you purchase a travel insurance policy to cover your family while on vacation. It might seem counter-productive to spend more money, if you have to cancel your vacation for any reason, you have a problem with your flights/hotel, someone gets sick on vacation, etc. you’ll pay little out-of-pocket to handle the problem. This guest post is from Allison with TravelInsurance.org.